Across two evenings in spring 1985 a variety of short films curated by the experimental filmmaker Peggy Ahwesh were screened in The Kitchen’s Video Viewing Room as part of a series entitled Super 8 Motel. On the first evening artist, writer and performer Lydia Lunch gave a reading entitled “Have Mouth Will Travel.” Lunch was also accompanied by the underground filmmaker Richard Kern to introduce the premiere of their film collaboration “The Right Side of My Brain” (1985). The 23-minute film, directed by Kern and narrated by and starring Lunch in addition to featuring music she had composed, was an example of the Cinema of Transgression movement that was emerging in New York City at the time with its themes of violence, eroticism, perversion and voyeurism. 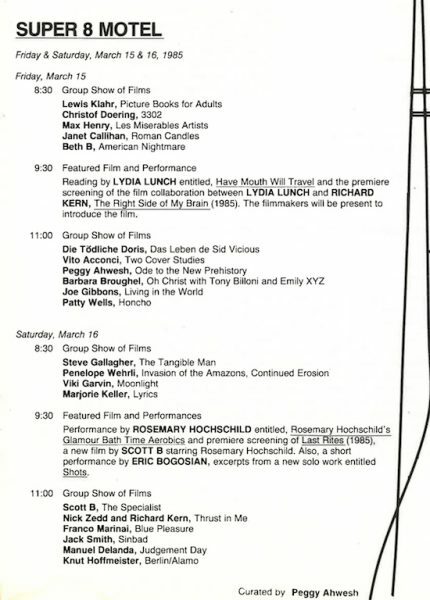 The second evening saw performances from the writer and actor Eric Bogosian (from his new solo work “Shots”) and from the actress and writer Rosemary Hochschild (entitled “Glamour Bath Time Aerobics”) as well as the premiere of No Wave underground filmmaker Scott B’s new film “Last Rites” (1985) in which Hochschild starred.